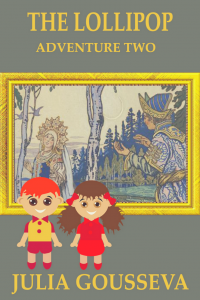 Adventures of Alex and Katie is a unique, fascinating and exciting series of early chapter books that take young kids on a journey into the magical world of Russian fairy tales. After their parents leave for Russia, Alex and Katie are left to spend the summer with their eccentric Aunt Karina. 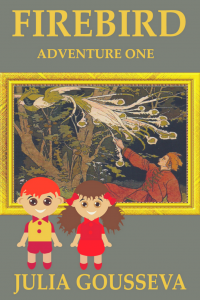 At first, the kids think that their summer is ruined, but when they discover a secret door behind the huge fireplace in Aunt Karina’s library, they sense that an adventure is about to begin. Reading early chapter books is an important step in children’s growth as readers and development as people. Transitioning from beginning readers and picture books to early chapter books can be challenging for kids and their parents, but it’s helpful in many ways. Early chapter books help the kids develop attention as they require them to keep a larger cast of characters and more events in their minds. Engaging and exciting early chapter books will make the kids think more critically and more creatively as well as become better problem solvers. The first chapter book of the series is The Firebird. Alex and Katie had just arrived to Aunt Karina’s house and discover that she has a bad leg that makes their aunt even stranger than all the weird little saying she likes to sprinkle in her speech. She tells them that feathers of the magical Firebird can heal her leg and shows them a beautiful painting of the Firebird in a secret room behind her fireplace. The kids want to go find the Firebird. 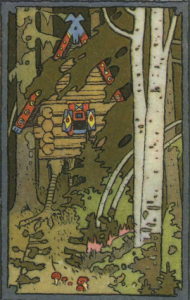 In his excitement, Alex stretches his hand onto the painting and discovers that he can step inside. His younger sister Katie follows him, and their first adventure begins. 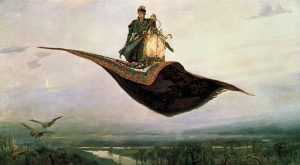 You can read the original Russian fairy tale that this early chapter book is based on at this link. The Lollipop, the second book in series, takes Alex and Katie on a rescue mission. They have to save a young fisherman who was captured by an evil Russian tsar and thrown into a tower for the rest of his life. His crime? He dared to talk to the tsar’s daughter, and the daughter fell in love with him, a commoner. The tsar is furious, the princess is distraught, and the young fisherman is imprisoned. Alex and Katie rush to help but get lost on the way to the palace. When they stop by a log cabin to ask for directions, a scary creature in a sheepskin’s coat with green furry hands opens the door. His emerald eyes shine a bright green light right at Alex and Katie. Is he a friend or an enemy? Will Alex and Katie find the young fisherman and rescue him? Will the princess and the young fisherman live happily ever after? Will Alex and Katie ever return home? A warm June morning turns bitterly cold. Thick white snowflakes fall from the sky, covering the fresh green grass and freezing flowers. Masha, a little girl, got lost in the unexpected storm that could turn deadly. Alex and Katie rush to the rescue. The wind is picking up, whistling through tree branches, creating white flurries on the ground and erasing Masha’s footprints. In the distance, a person dressed in a white sparkling coat and a silver hat is walking between the trees. “Masha!” Alex and Katie start running. The person turns around. It’s a tall elderly man with a long white beard. His brows are furrowed, and his eyes look cold and furious. He opens his mouth and starts blowing cold air at the kids and at the path, sweeping away all the footprints. Alex shivers from the mind-numbing cold. “Katie, help! We’re going to freeze!” Alex calls out. “Stay calm and follow my lead. 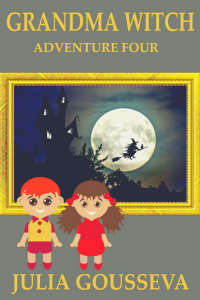 I know exactly what to do,” Katie says, and the kids are off to a new adventure! 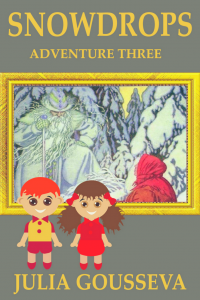 A three-headed dragon kidnapped a little girl. Cinderella is in big trouble. Her beloved Prince never came back from his horseback ride in the forest, and she feels devastated. It is up to Alex and Katie to find the Prince and restore order in the kingdom. But first, the two courageous and smart kids have to figure out what happened. Did someone kidnap the Prince? Is he still alive? And will he and Cinderella ever be together again? 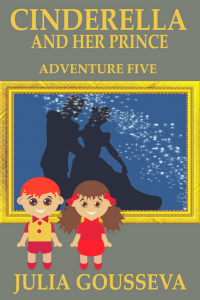 It is up to Alex and Katie to solve this mystery, rescue the Prince, and help Cinderella live happily ever after. 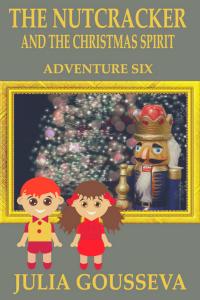 Alex and Katie are on a new adventure: they need to save the Nutcracker and the princess from an evil spell. They step through the magical painting and enter a snowy town on Christmas Eve. The kids see a sleigh and an elderly man in a long coat delivering gifts. They rush to him only to discover he is not who he seems. Will Alex and Katie be able to save the Nutcracker, find the princess, and crack the magical walnut before the clock strikes twelve? “The Nutcracker and the Christmas Spirit” is a fast-paced and exciting adventure with a message for the season: the power of the Christmas spirit can melt the darkest of hearts.